Sanitation is not an easy thing to maintain, this is especially true in public places such as shopping malls, restaurants and in work places where things can get somewhat muddled and messy. When washrooms experience a high volume of traffic, along with the inevitable rush that cause people to become clumsy or careless with their sanitary waste, this cannot be easily avoided. One of the best ways to maintain workplace sanitation is to set proper guidelines for sanitary disposal. Yet, this is not the end-all of sanitary management, especially since sanitation doesn’t end in sanitary disposal. One of the problem areas with regards to most office or workplace sanitary management solutions is in the ‘primitiveness’ of sanitary equipment. Most people are actually unaware that even a harmless sanitary bin can be a hotbed of microbes and pathogens that can help spread disease. Thankfully, there are new and better innovations in the light of high-tech sanitary management and disposal equipment such as automatic sanitary bins, anti-bacterial wipes and soap dispensers, to mention a few. Automatic Sanitary Bins are certainly a thing of the future. Not only is it a never-before-seen innovation that can be credited to the ever-expanding influence of technology in our daily lives, but it also stands as a testament to the innovation of modern minds and the effective use of technology. Truly, automatic sanitary bins revolutionise sanitary disposal. How do automatic bins do that? Automatic sanitary bins allow individuals to maintain proper hygiene all the while serving the purpose of a traditional sanitary bin. Automated sanitary bins function with a ‘no-touch’ system – one that allows a person to place their sanitary waste into it without having to touch the bin itself. Automated sanitary bins thus prove indispensable for nearly all industries that require a fast, efficient, reliable, and utterly flawless way of disposing of their sanitary waste. Bin Functionality – Does the unit really work the way that its supposed to? The unit should not require you to actually touch it, and the unit should open when necessary and never any other time. Bin Lifespan – How long does the unit work until it stops opening? The unit should continue to work between service intervals. The unit can be serviced or picked up and replaced with a new unit. Bin Design – Is the bin designed to fit comfortable in the Cubicle/Washroom and doesn’t get in the way? The unit should be designed to provide the user with easy access. Ease of Use – Does the bin have adequate instruction for its use? The unit should include instructions on how to operate it, so that the user shouldn’t struggle to use it. How does Vedder cater for these requirements? Vedder Sanitary Services is in constant research and development for the latest model and design for Automatic Sanitary Bins. Vedder has a variety of designs and bin sizes that all retrofit together to provide Customers with ample choice. Our premium no-touch Sanitary Disposal Unit has been carefully designed, developed and tested by us exclusively. We have been in the industry for over 40 years and have developed a superior unit to meet the needs of our customers who would like a smart and modern addition to their washrooms. There have been many sensor bins on the market which through thorough research and feedback to be unreliable, often leaving the customer with a unit that needs to be manually opened, for the price of a premium sensor service. Vedder has spent 4 years of research and development and 6 prototypes have been made. Each protoype of the mechanism and unit have been extensively tested before re-development. The Vedder Sensor is different to others: it is washed and sanitized in a high temperature washing machine with no comprimise to the electronics. Our entire unit is able to be washed and sanitised at high temperatures between services, providing reliable technology use after use. Why Vedder Automatic Bin Units? Our units are designed to be washed in our high temperature washing machine, including all electronic parts and mechanisms. The electronics are not affected by high temperatures, ensuring you are getting a completely sanitised bin every service. Our point of difference is that Vedder Automatic Bins are always washed and sanitised at our depot before every service. We provide you with a completely fresh unit, replenishing your washroom with only safe and hygienic bins. Vedder believes in honesty and transparency with the services we provide. We do not provide unsanitary ‘cubicle services’ which involve leaving your washroom with the same unit. This compromises the hygiene of your washroom environment as a whole. Our standard and manual Sanitary Disposal Service is available also. The manual units are also impregnated with anti-microbial agents. Our Sensor and Standard Sanitary Disposal Service can assist you in meeting legislation and your Duty of Care to your customers or staff members, providing a clean and healthy washroom environment. 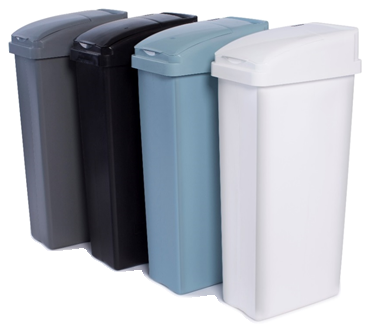 Sensor Bins in four different colours. For more information regarding Automatic Sanitary Bins, you can contact us.